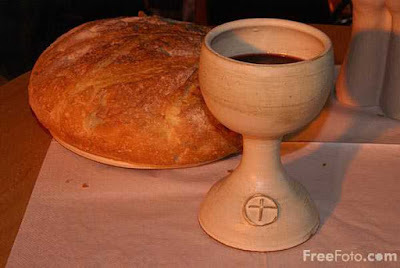 Walking with Jesus: Day 163: John 6:22-59 & Psalm 19 - What did Jesus Mean by Eating His Flesh and Drinking His Blood? Day 163: John 6:22-59 & Psalm 19 - What did Jesus Mean by Eating His Flesh and Drinking His Blood? What did Jesus Mean by Eating His Flesh and Drinking His Blood? Few passages of Scripture have proved to be more divisive or more offensive than today's teaching from Jesus. When He first spoke these words, many reacted by saying, "How can this man give us his flesh to eat?” and then by walking away from Him altogether, taking the number of the followers of Jesus from huge crowds of thousands down to the 12. So, what did Jesus mean when He said that we must eat His flesh and drink His blood in order to have eternal life and to abide in Him? Well, as strange as His language is, Jesus is talking about faith. It is clear in the context of John 6 that eating Jesus' flesh and drinking His blood are other ways of talking about coming to Him and believing in Him. How can we know this? Well, Jesus says that whoever eats His flesh and drinks His blood "has eternal life, and I will raise him up on the last day." Well, this is exactly the same language He uses in verse 40: "For this is the will of my Father, that everyone who looks on the Son and believes in him should have eternal life, and I will raise him up on the last day." It's also very similar to the language of verses 44 & 47: "No one can come to me unless the Father who sent me draws him. And I will raise him up on the last day . . . Truly, truly, I say to you, whoever believes has eternal life." So, before Jesus says what He says in verses 54-56, He has already given His meaning in clearer language in verses 40-47. As is so often the case, people get mad and confused about what Jesus says because they only listen to part of His message and not all of it. So, if He means believing in Him and coming to Him, why talk about eating and drinking Him? First of all, we can acknowledge that Jesus was intentionally using provocative and divisive language because we wanted to drive people away. He knew that most of the people who were "following" Him did not truly believe in Him. They just wanted free food and freedom from Rome. So, He used this striking language in order to drive them away. But He also had good, positive reasons for using this language, reasons that we can still benefit from today. Jesus wanted us to understand that believing in Him means to have His life and death become central to who we are. Faith unites us to Jesus, so that He is in us and we are in Him. Eating and drinking are powerful ways of driving home the essential and vital nature of this union. Further, Jesus wanted us to ponder the meaning of His life and His death, of His body and His blood. He wanted us to think of righteousness, peace and life, all of which are embodied in the metaphor of bread. He wanted us to see our need for forgiveness and cleansing, for a substitute sacrifice, all of which are captures in the image of blood. You and I need Jesus, not in some superficial way, but in the deepest part of who we are. We need His life to be our life. We need Him to be our peace. We need His death to be our death. We need the deep cleansing of our souls that His death alone brings. All of this we gain when we come to Him, believe in Him and abide in Him. This is what it means to eat His body and drink His blood.